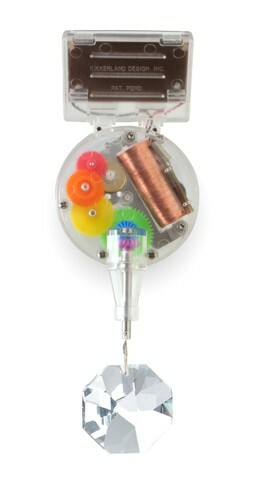 Rainbow maker that casts rainbows around the room. Solar panel powers the unit to revolve and refract light in all directions. Genuine Swarovski crystals create maximum rainbow effect. Great for brightening a room; designed for Kikkerland by David Dear. Comes with suction cup or wire hanger; measures 2 by 1 by 6 inches. Solar-powered and endlessly entertaining, this Rainbow Maker from Kikkerland sends a cascade of brilliant rainbows around the room on sunny days. The unit features a suction cup mount so it can attach to any window or glass door in the home, and its motor requires sunlight but no batteries to operate. In action, the genuine Swarovski crystal rotate smoothly, catching and refracting light as it goes. An enchanting treat for adults, children, and pets, the smart little device combines clear casing with colorful gears, so the inner workings become part of the display.